RX-7 injectors again. - Miata Turbo Forum - Boost cars, acquire cats. I'm color blind. What color tops are these? Assuming this page is right, I should be looking for purple tops to get high impedance 550s. Is the ebay add wrong? they look purplish to me. i just bought some rx7 injectors last week and when they turned up in the mail, they were a different shade of colour from his ebay photo.i quizzed the seller about this and he reckons it is just an exposure problem with the digital camera he used. this seemed like a fair explanation to me. cheap digital cameras don't always get colours exactly right. i know for a fact that many cameras have a hard time dealing with purple too. i've seen photos of a purple guitar amp that make it look like a green guitar amp. yes mine were black and red, but in the photo they looked more pink than red. i think the purple ones are from the later model rx7. they are actually red, but faded a bit so they look a bit orange. anyway, the point is, the camera can sometimes lie. Get the part number as it should end in -2020. Otherwise i just bought a set off a guy and they look just like that. Seller responded and said they were off a 20B then said they were low impedance. Would save me from shipping used ones off to Witchhunter. 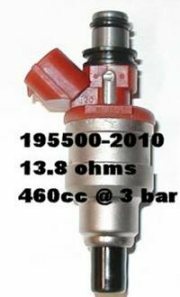 damn- that's a deal IMO for new 550 injectors. I paid way more than that for a used set and cleaning (a few years ago). hold on a second, the 550cc injectors are low impedence? I bought a set from a forum member "kung fu jesus" and when I bought them he assured me they were high impedence. They look just like those ones on ebay. I mean they are working right now but im having trouble getting a good state of tune and that could be a problem if theyre low imp. got a multimeter, you can check it out in 2 seconds. By glancing at the 550s in the first post they look High Ohm to me. Note the tabs located on the bottom of the connector, that's a type "F" connector like ours, which means it's high ohm. The the tabs are on the top, they are a type "E" connector and low ohms. look at the connector, it's a direct PnP to the miata. Strange that the new ones from Dr. Injector look like the tabs are on the top, but they have the ohm spec listed in the ad. 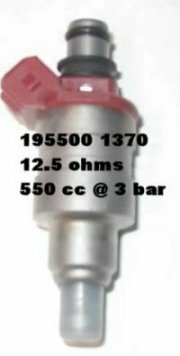 Rockauto.com has GB manufacturing remanned injectors for 43.79 or 33.79 w/core charge. P/N 84212172. %5 off coupon code 500089458315.
Who wants to be the guinea pig? Those look like my dark red series 5 injectors. They are plug and play as far as I know. The 3rd gen ones are low impedance and I think a slightly different color as well. And yeah, they are most definitely 550 cc. I have heard they are closer to 580cc. that's why it's best to find part numbers. Colors are sometimes hard to determine, and people say one thing and you get another. I am in the same boat and don't want to screw up but also get a good price. Here is some more good RX-7 injector identification information. Some is repetative but what the heck. Its from www.rotaryresurrection.com. GP Sorenson part 800-9416 Fuel Injector Connector. I have not found an aftermarket source for oval injector clips. 1986 and 1987 model cars used low impedance(2-3 ohm) injectors. 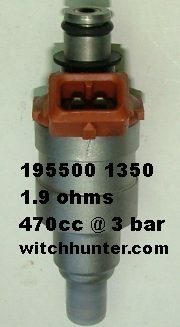 Low impedance injectors have a center notch on the plug. The wiring harness used with LI injectors integrates an injector resistor pack, wired inline between the ECU and injectors(under stock air box) to bump overall load seen at the ECU to 12-13 ohms. 1988 and later models used high impedance injectors. 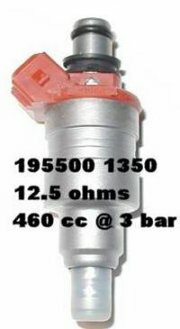 1988 HI injectors have an offset notch on the plug, and all post 1988 injectors are HI with an oval plug(until 3rd generation side feed injectors which are totally different). The wiring harness on these models deleted the injector resistor pacl, carrying the 12-13 ohm load from the injectors directly to the computer. When performing engine/wiring/injector swaps, the type of setup must be noted and kept together. This is easy as LI injectors will only plug into a harness meant for them(due to the position of the plug notch) and vice versa for HI injectors and harnesses. 88 and post 89 HI injectors and harnesses are not interchangeable. A car that previously ran one type of setup can be changed to the other…keep the injectors and wiring harness together. The ECU will not know the difference. TO do so you must modify the injectors to fit the opposing wiring harness by taking off the notch on the plug. IF using LI injectors on a HI harness, you must splice into the harness, at each injector lead (for a total of 4) 10 ohm/10watt resistors available at radio shack for a couple of bucks. Doesn't matter which wire of the 2 per injector you splice to, polarity isn't an issue here. This bumps the LI resistance up to acceptable load for the ECU to see. IF using HI injectors on a LI harness, you must unplug the resistor pack. Next, locate the supply wire in the center of 5 terminals. Bridge jumper wires from this terminal to each of the 4 outlying terminals, which basically completes the circuit without resistors, carrying the HI injectors' 12-13 ohm load directly to the ECU just as a HI harness would. Quick Reply: RX-7 injectors again.